September 17, 2013. The dead orca male found near Tofino is identified as I46, of the I31s, born in 1985. A54, Blikhorn of the A30s was also reported with a new calf. This is her fourth calf. 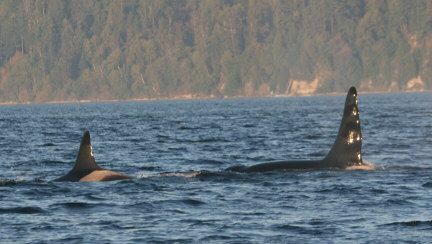 Graeme Ellis and I wanted to let you know that Springer was observed last Thursday, July 4th, off the BC central coast and she was accompanied by a new calf. Springer and her calf were travelling with the A35 matriline, part of her natal pod. Both mother and calf were looking good. At 13 years old, this is about the normal age for Springer to have her first calf (average for northern residents is 14 years, range 10 to 21). 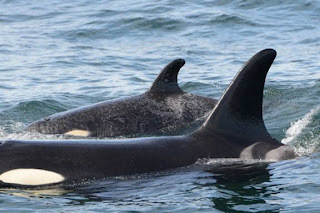 This is great news for Springer given all she went through as an orphaned calf, her rescue in Seattle and her successful release back to the wild. Let's hope both she and her calf continue to thrive! Orcalab reports that the matriline A30 (Tsitika) is missing and presumed dead. A85 (Codero) is travelling with the A23s choosing to specifically spend time closest to A60. This is a happy postscript to the sad reality that A51 (Nodales) and her youngest calf are probably gone. A61 (Surge) came in travelling with the A8s. So A51's little matriline has split apart with her demise. Fantome (A91), Sunday (A92), Cypress (A93), Mystery (A94), Fern (A95), Blackfly (C29), Sweeper (C30), and Naden (C31) have all exceeded their first year of life. Hooray! Calves A96, A97, A98, D26 and I109 were all born between 2010 and now. None have survived their first year of life yet though so they remain nameless. Hopefully all five (and more) will be seen thriving this summer. Fern is Corky at SeaWorld San Diego great niece or nephew. Though they never knew each other, Ripple (A43), Fern's Grandmother, is Corky's little sister. Mystery is Springer's aunt or uncle. Springer's Grandma, Kelsey, (A24) is still producing healthy calves in her forties. January 27, The I11s visit Johnstone Strait at January 26 and 27. Orcalab spotted a new baby with I13. This is her third calf after I75, born in 1995 and died in 1998 and I108, Tatnall, born in 2005. Here's a photo of J1 and J2 from last October in Admiralty Inlet. The last time we got to see J1/Ruffles was November 4th in Admiralty Inlet, nearly in the same spot where we were with J pod on Sunday. We were saddened to see J2 without J1 anywhere in sight, and though we hope his big, ruffled fin will show up and surprise us all, he has not been sighted since Nov. 21st, and J2 has been seen several times without him since then. There appears to be a new calf traveling with L55(see photo above. This is a different calf from the one observed on Dec. 6th seen traveling with L5 (L117). We are tentatively calling the newest calf L118 and will confirm the number of new calves once we have had a more conclusive L pod encounter.